The Rice Terraces of Banaue are considered by many to the be the 8th Wonder of the World. The mountainsides of the area have been carved out to create terraces for rice farming over the last 2,000 years. The photo above is of a local Ifugao woman in a traditional dress who let me take her photo for a few pesos. As I’ve seen other photos with her in it, I can only assume she makes money this way. The Rice Terraces in the Philippine Cordilleras region was designated a cultural site by UNESCO in 1995. The site represents over 2,000 years of ancient and cultural living landscape that illustrates how the Ifugaos in the area has lived in harmony with nature. It also showcases a sustainable agricultural method that has been passed down from generation to generation. There are five sites included within this World Heritage Site property: 1) Batad Rice Terraces, 2) Bangaan Rice Terraces in Banaue, 3) Mayoyao Rice Terraces in Mayoyao, 4) Hungduan Rice Terraces in Hungduan and 5) Nagacadan Rice Terraces in Kiangan. 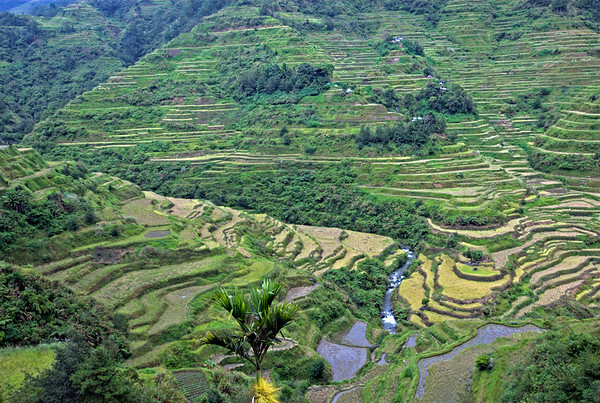 All of these rice terraces sites are located in the Ifugao province of the Philippine Cordillera Region. 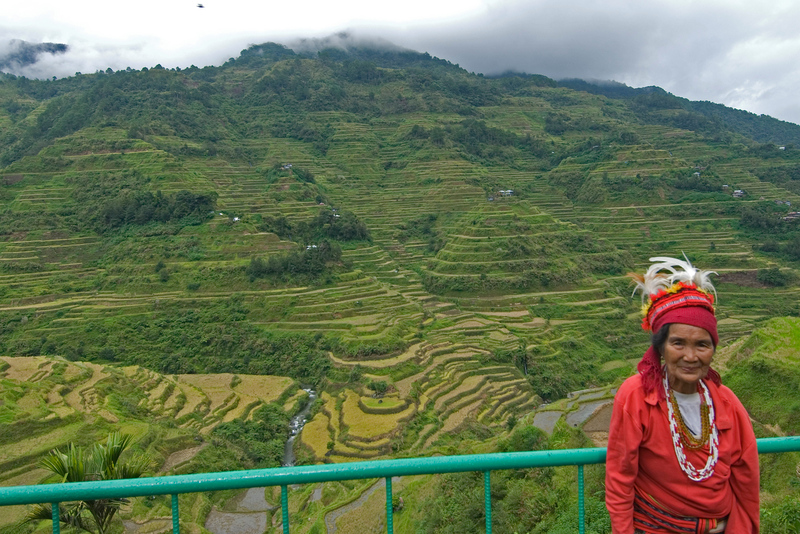 The Banaue Rice Terraces are the most famous of the rice terrace sites in this UNESCO property listing. It is located 348 kilometers from Manila. Buses have daily trips to Banaue and the drive can take between 8 to 10 hours. When planning to visit, the ideal time is in June. This coincides with the harvesting season and the landscape is golden. 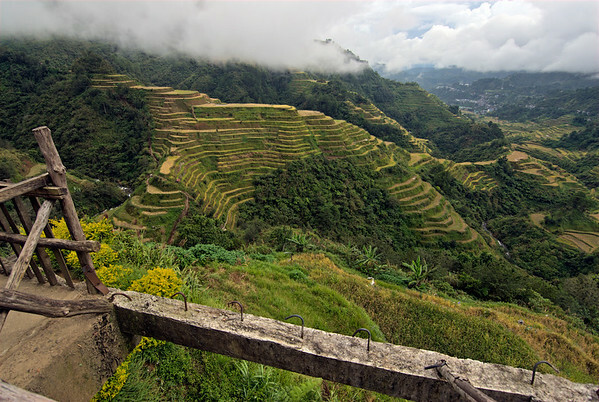 The rice terraces in the Philippine Cordillera follow the natural contours of the mountains in the region. The original builders of the terraces used mud and stone walls in order to construct these terraces. These walls serve to hold the pond fields with which the rice was cultivated in. Aside from the construction of the pond fields themselves for planting the rice, the Ifugao natives also developed an irrigation system that would supply water to these plots of rice. The water used for irrigation is sourced from the mountaintop forests. It is an engineering feat for farming that was way ahead of its time. The rice terraces in the Ifugao region of the Philippines play a vital role in its cultural formation. Hence, they are considered national cultural treasures. The terraces play a central role in the locals’ survival primarily because this is their main source of food. However, the season system of planting is also intermingled with some religious rituals. The act of planting and harvesting is an activity shared by the entire community. Due to modernization, the site has been placed on the list of UNESCO World Heritage Sites in Danger. More than 25 percent of the terraces have been abandoned and continues to deteriorate. Today, its value is primarily on tourism and its contribution as a source of rice has been exceeded by that. Yeah, they are great … Had few beers there, too. But I agree, that Batad is even more specular. And there are also some similar, colossal terraces in Southern China (but not as old …? ). I’ve been there twice.. Nice place, eh? And yes, people like her make a living out of pictures with tourists..
Nice photo. Being a Filipino, this makes me proud of my heritage, Banaue however is not the best of all the terraces. Batad rice terraces, is considered by the local folk as more pristine than Banaue rice terraces. Banaue has been called house terraces. I am sure you have noticed more and more houses have been set up at the terraces. Too bad. Articles and photos like yours should remind us here to preserve the terraces for future generation. The Rice Terraces of Banaue are considered by many to the be the 8th Wonder of the World. The mountain sides of the area have been carved out to create terraces for rice farming over the last 2,000 years.